Loaded values exceed that of a single split collar by about 10%. 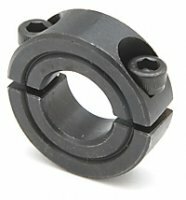 Used for mid-shaft applications when components such as bearings, sprockets or sheaves are already in place, or when a slightly greater axial load is desired. Can compensate for a slightly undersized or oversized shaft. Held in place by two socket head cap screws. Inch -steel, black oxide and bright finish stainless steel. Aluminum. Metric – steel, black oxide and bright finish stainless steel. Make sure you see our full selection of shaft collars.